If you are a builder who is looking for skip bin hire, we have a great news for you because you have just come to the right place. Any builder would like to work with such a bin hire company which can easily meet its requirements and has all the resources to carry out all kinds of tasks. 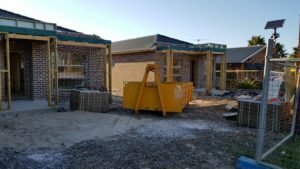 After dealing with a handful of industrial clients, we have gained enough familiarity with the different types of services the builders are looking for in their projects. Our strength lies in our knowledge about waste management and skill related to industrial rubbish removal in Melbourne, especially when it comes to construction works. Zaks Bin Hire has prepared itself with all the relevant equipment and hired such professionals who are experts in their respective fields. No matter what you choose from our wide selection of skip bins, it will be both practical and affordable allowing you to carry out on-site waste management efficiently. We believe in making things easier for our clients, hence, you will find that our staff is trained to optimize the tasks and saves significant time while carrying out the cleaning process. It pays attention to all the details and utilizes its time and resources in the best possible way. Whenever you require our services for waste management and removal, the expertise of our personnel will be right at your disposal. Considering the nature of the construction and the desires of each and every client, it would suggest the best way to clean up the waste on time and charge the minimum amount. When our team leaves the construction site, there is no debris left behind and the workers can resume their work the next day in a very clean environment. We understand that working at construction sites is both time-taking and requires a lot of energy. So, we work along with our clients to meet their unique demands and get the area cleaned up right within the time frame. Zaks Bin Hire has unique bins which come with drop down ramp making them ideal for wheelbarrow access. Our heavy duty construction bins are of the top quality fitting the demands of the builders for their large residential or commercial construction and renovation projects. There are clients who believe that they can get the job done quickly and easily by hiring a large skip but this only adds to their hassle. Getting a smaller skip is far more convenient because it can be filled without impeding the movement of the people and materials, especially for residential projects. You must only choose the larger bins when you need to handle bulk material, for example, during the construction of a mall or a plaza. Since the waste would be tremendous and there would be extra space to accommodate the large-sized bins, getting them would mean that you will be able to speed up the process and manage the waste effectively. The waste which is produced from the industries is the most difficult to manage because it contains hazardous chemicals and items that are extremely damaging for the environment. Zaks Bin Hire’s years of experience has made us a pro in handling such sensitive materials. We have the most flexible waste management solutions which address the needs of our clients while ensuring that none of this deadly waste becomes a permanent part of our environment. We have specialized builder skip bins to handle the hazardous waste so that even those people who are collecting it remain safe at all times. Our expert and friendly staff will be more than happy in helping you decide which size of the skip would be perfect to handle the chemical waste from your industrial unit. While our services cannot be matched by anyone in the field, we also guarantee that our prices are lesser than anyone else. When we have decided on a certain price, there will be no hidden or extra charges in the invoice. All you need to do is lay down all your requirements to us at the very beginning so that we can create a quote accordingly. We do realize that unexpected delays can happen so we keep the time margin in our minds and easily accommodate the drop-off and pick up times. Our approach is very realistic and we do not make false claims, therefore, you will be getting top-notch services for the price you have paid us. There’s nothing more and nothing less! For further inquiries into the skip bin hire services available for the clients, call us and talk to our representative. Our staff is skilled and knowledgeable to let you know what would be the ideal choice for you. Book an appointment and let us make rubbish removal in Melbourne a breeze for you! What type of waste are you disposing? When do you need the bin?